For the latest updates on the new Surrey MIRRA Condos in Newton District, please click here. Oct 2009 Update: Last Chance to Purchase at Nuvo Surrey Townhomes! A collection of 54 pre-construction townhomes conveniently situated at 144th Street and 61A Avenue in Surrey property market, Ravina Townhouses lets you refresh, relax, and rejunvenate. Easy access to shopping, restaurants, schools and parks. Spacious floor plans and generous yards mean there’s plenty of room for growing families at the new Ravina Townhomes in Surrey. For more details about this upcoming property, please visit www.ravinaliving.com. 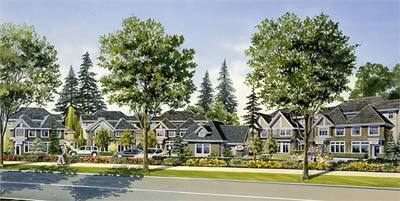 The grand opening for Ravina Townhomes in Surrey is scheduled fro June 14, 2008. Refresh, Relax and Rejunivate. These forty luxury pre-construction Surrey townhomes at Ravina feature three and four bedroom layouts with double garages. Quiet, tranquil, elegant. Ravina Townhomes in the new Surrey real estate market is a new way of looking at the world. No hassle, resort style living right at home. Lush greenery surrounds you. The new pre-construction Surrey Ravina town homes and townhouses puts you at the heart of the world of new experiences. Live theatre and musical extravaganzas are found practically at your doorstep in the Bell Centre for the Performing Arts. Luscious golf greens, stimulating educationl opporutnities, state of the art recreational facilities at the YMCA, decadently delicious dining, and shopping from big box to exotic boutique are all just minutes away from this master planned townhouse community at Surrey’s Ravina townhomes. Life is good. You deserve it. Mackenzie Properties real estate development and the Ravina townhomes pre-construction site is at 14462 61A Surrey BC. A small collection of Surrey townhomes numbering only fourty now are available at Ravinda including both 3 and 4 bedroom executive homes with double garages. Now available and providing lots of room to love, Ravina pre-construction Surrey townhomes offers spacious 1,718 sf four bedroom homes with a double side by side garage. For a limited time offer, the pre-construction Surrey townhomes at Ravina start from just $389,900 and the Phase 1 of Ravine homes are now selling already with a five thousand dollar free upgrade package. Great location: With many local amenities just blocks away from this new Surrey real estate development, home purchasers can enjoy the Bell Centre for Performing Arts, grocery stores, boutique shopping, restuarants/dining, recreational facilities such as golf courses, ruby and cricket fields and much more. There are also six schools within the immediate vicinity at the pre-construction Ravine Townhomes in Surrey BC and you can also get to Guildford Town Centre or Willowbrook very easily. The first phase of the pre-sale Ravine Surrey real estate opportunity opens now with just an offering of 40 preconstruction townhomes price between $389,900 to $429,900. The sales centre information was listed above and you can visit ravinaliving.com for the online details. The first impressions of the Ravina pre-construction Surrey townhomes is that the address provides unparalleled views of the North Shore mountains, snow capped during the winter time and magnificent and majestic during the summer. Crisp and fresh air is what you will be looking forward to at the country style community where the pre-sale Surrey Townhomes at Ravina are located. The details within each of these preconstruction Surrey homes is awesome including shaker cabinetry, art curves, eating bars, chef inspired kitchens, glass showers with large ensuites as well as side by side barages. You deserve only the best. Purchase a new surrey townhome at Ravina today. Ravina Surrey Townhomes Phase 1 Now Selling! From $379,900, for a limited time only, pre-construction Surrey townhome homebuyers can receive $5000 cash back on their purchase of a new Ravine townhouse. Phase 1 is now underway and one of forty luxury Surrey townhomes awaits you with four bedrooms plus side by side double garages! Come home to resort style living here at the Surrey Ravina townhomes real estate masterplanned community. Be part of the community where people share your values and interests, where neighbours become friends and life flow effortlessly. Come home to Ravina Surrey townhomes today. What’s included with your pre-sale townhome purchase at Surrey’s Ravina? Granite counter tops, fenced backyard, tiled floors in all bathrooms and ice/water double fridge. Also included with your presale Ravine Surrey townhome purchase includes stainless steel appliances, washer/dryer (stackable) as well as crown mouldings and 12.3 mm laminate on the main living floor area with 9 foot smoot ceilings too. The Mackenzie Proeprties also includes the 2-5-10 year home warranty and the new Surrey Ravine townhomes sales centre is located at 14462 61A ave in Surrey and is open Saturday-Sunday from 2 to 4pm and by appointments over weekdays. A collection of only fifty four Surrey townhomes for sale is conveniently located at 144th Street and 61A aVenue in Surrey, Ravina lets you refresh, relax and rejuvenate at home. Floor plans for these pre-construction townhouses at Surrey’s Ravina real estate development are spacious and the fenced backyards are generously sized meaning there’s plenty of room for growing families. Inside, you’ll find two piece powder rooms on the mian living level, kitchens featuring a stylish interpretation of traditional Sherk cabinetry accented by brushed pewter pulls with an intriguing, industrial art curve and finish that’s reminiscent of Soho lofts and galleries. Every new pre-sale Ravina Surrey house als includes the convenience of a side by side garage. Easy access to shopping, restaurants and parks plus five golf courses and six schools. The Ravina Condo presentation centre and Ravina display home are open on weekends between 2 and 4pm or by appointment as well at 14462 61 A Avenue in Surrey (just south of the Bell Centre for Performing Arts). For more details about the Ravine Townhouses for sale in Surrey, please visit www.ravinaliving.com or call 604.598.3694. Offered only to the first ten homebuyers to complete on their pre-sale Surrey Townhome at Ravina town houses, this incentives provides a $10,000 cash back upon closing! The grand opening of the new Ravina Surrey show home is happening on March 7th, 2009! Room to Move. Ravina Townhomes in Surrey real estate market offers spacious seventeen hundred and eighteen square foot four bedroom homes with a double side by side garage, very unique to the Surrey market these days! All this and more at Ravina Surrey townhouses for sale at pre-construction pricing starting from just $359,900! Located in South Surrey’s popular Rosemary Heights neighbourhood, NUVO offers 43 three bedroom live and work townhomes in a lush-park like setting. Each of these Nuvo Homes in Surrey real estate is deigned with a spacious, dedicated workspace boasting separate entrance fro a perfect balance between personal and professional space. So whether you’re a seamstress, an architecte, or simply appreciate an exra room in its own space, Surrey pre-sales townhomes at Nuvo let s you take charge of your life. Watch for Nuvo townhomes’ grand opening coming soon to 15454 – 32nd Avenue in South Surrey real estate. Sales commence this summer. Register now to receive VIP information by visiting www.nuvoliving.ca. According to their website: Nuvo townhomes offers an exciting real estate opportunity to own an impeccably designed home that is the perfect balance of personal and professional living. This forward thinking South Surrey pre-sales real estate development is an open invitation to live the life that you want to live. No more tiring commutes, no more traffic jams. Just grab your coffee – your office is just steps away. There are only 43, 4 bedromo pre-construction Surrey NUVO townhomes available in this beautiful park-like setting at 32nd Avenue and 154th Street in South Surrey, so register now. For the hybrid life, choose the future. Choose Nuvo. Presentation centre is opening soon. One Address: This forward thinking new South Surrey real estate property project locate din the ultra desirable neighbourhood of Morgan Creek is coming to the market very soon! Nuvo is the perfect choice for a select few owners! For the hybrid life, there is no better townhome Surrey development than at NUVO. THE PERFECT CHOICE. Qualico Development and Porte Development are proud to invite you to a special VIP NUVO Morgan Creek townhome condo pre-construction sales preview of the only live/work development currently being offered in South Surrey. As a valued NUVO Surrey townhome guest, we are presenting you with the opportunity to purchase before the general public. Refreshments will be served. Presentation Centre opens to the general public July 19. FOR A SELECT FEW. This forward-thinking development of 43 pre-construction Surrey NUVO three bedroom townhomes in a park setting is located in the ultra-desirable neighbourhood of Morgan Creek. The perfect balance of personal and professional, every pre-construction South Surrey Morgan Creek NUVO home has a spacious, dedicated work space complete with separate entrance. So whether you’re a seamstress, architect or simply appreciate the extra room to do with as you like, Nuvo pre-construction townhomes offers you a life that leaves you in charge. Forward thinking style at Nuvo townhomes written by Susan B. for homebase media on new Surrey real estate developments. “Nuvo is currently the only live/work development in this Surrey neighbourhood,” Tracy says spreading out a series of floor plans. “You have a family space here.” She points “and you have a space ith it’s own, private entrance but that’s still connected to the rest of your home. It’s perfect for someone like an architect or a graphic designer who works from home and wants to keep business and personal life separate. I smile wistfully to myself thinking: perfect for a writer too. As we chat about Nuvo Surrey townhome’s finishing’s and interiors, something else becomes clear. There are not just forward thinking homes, they’re going to be beautifully appointed as well. Flooring in the main living areas as the pre-construction new Surrey townhomes at Nuvo town houses is genuine engineered wood – rich, elegant, and durable. Windows at Nuvo Surrey townhouses are everywhere, and doors have transom windows about allowing even more natural light to flood each room – we are, after all talking about South Surrey real estate with its many extra hours of sunshine. Kitchens at the new Surrey Nuvo townhomes are created with the gourmet chef in mind – granite or Caesarstone counteres, side by side fridge with ice dispensor, centre islands, and storage to accommodate even the most avid collector of kitchen gadgets and gizmos. Everywhere is an understated scene of quality that’s simple ‘there’ at the new Surrey townhomes of Nuvo real estate. “Nuvo appeals to a broad range of buyers because in addition to being live/work, we have several different foor plans,” Tracy says. “For example, some come in master on main design which often appeals to people whoa re downsizing. But was also have plans where the entire top floor is one enormous master suite – it’s quite spectacular.” Who says you can’t live life on your own terms? The new Nuvo Surrey townhomes offers a total of only 43 exclusive pre-construction South Surrey townhomes ranging from 1,769 to just over three thousand square feet in size. All pre-sales Surrey homes at Nuvo townhouses include a dedicated workspace with private entrance, and there is a private amenity building with lounge and boardroom that’s ideal for lager meetings for events. Prices of these new Nuvo townhomes in South Surrey real estate pre-construction market start from just $419,900. The Nuvo town home presentation centre is now open noon to five daily at 15454 – 32nd Ave in South Surrey. For more information call 778.294.1201 or visit www.nuvoliving.ca. According to Susan: you’re an individual, unique. You march to your own drum and live life on your own terms. You insist on quality, value privacy and appreciate natural beauty. 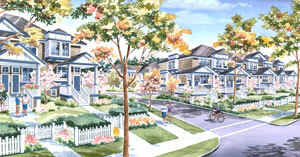 Introducing Nuvo South Surrey pre-construction townhoes, a collection of duplex style townhouses built with you in mind. And for anyone, like me, who want a special place to call “Home Office,” pre-sales Nuvo homes offer something rare – true live/work design. I’ve driven past the pre-construction Surrey townhome site before, always admiring the lush, old growth tres and sense of quiet tranquility. Once, I even walked the property and discovered a charming waterway bubbling through the middle – although it’s taken me till now to find out it’s acutlaly an extension of South Surrey’s famous Morgan Creek. Now I can see how this intimate community is developing at Nuvo South Surrey real estate’s newest pre-construction townhome release of homes – with meticulous attention t preserving the natural setting and creating community green spaces. “In fact, more than half the homes will back directly onto the preserved greenbelt,” says sales representative Tracy Burnett. “and because we are such low density, there wil be meandering pathways and outdoor setting areas. It’s going to be very lush and very green.” Learn more about the new pre-construction south Surrey Nuvo townhomes today. Mark your calendar, your wait is over! We are extremely pleased to announce that our two spectacular presale NUVO Town Homes and Duplex Residence show homes will be ready for your viewing pleasure on Saturday September 13th at 12:00 noon in Morgan Creek Surrey real estate market. Hurry in to reserve your one of a kind pre-construction new Surrey home. Nuvo Morgan Creek real estate development offers a limited collection of duplex style presale town homes backing onto 4 acres of heavily treed forest, with a tributary of Morgan Creek running through. Imagine sitting on your patio sipping coffee, listening to the birds and rustle of leaves, in complete privacy. All of our presale Surrey NUVO homes are loaded with high end finishing including hardwood floors, granite counters, Whirlpool stainless appliances, 9 foot ceilings and much more. The pre-construction Surrey Nuvo Morgan Creek duplex and townhouse is a small, intimate community of only 43 presale new homes and offers dedicated work space with separate entrance for those who prefer to work from home. These 3 bedroom NUVO Surrey town homes range in size from 1769 square feet up to 3059 square feet and are priced from $419,900. We are excited to offer these distinctive pre-sale Surrey town homes for your consideration and look forward to helping you with your purchasing decision. Our pre-sales Surrey NUVO Morgan Creek real estate presentation centre is open daily from noon until 5:00pm. The Nuvo Sales Team: Tracy Burnett, Susan Traunweiser and Andrea Kunova. Some of Surrey real estate’s best marketing can be seen with the NUVO tonwhomes property development by Porte Development Corp and QUALICO. The NUVO Showhomes open September 20th. According to their latest pre-marketing sales advertisement: This beautifully designed enclave of 43 three bedroom presale South Surrey homes, nestled beside 4 acres of serene forest, is sure to inspire relaxation and tranquility. Imagine sitting on your private patio in the morning, sipping your coffee, listening to the birds and the rustle of leaves as your read the morning’s paper. South Surrey NUVO high-end features and finishes such as hardwood flooring, granite counters, Whirlpool stainless steel appliances and sleek contemporary kitchen fixtures are all standard. These unique South Surrey NUVO homes offer a dedicated work space with a separate entrance for those who prefer to work from home. Sizes of these NUVO townhomes in the South Surrey real estate market range from 1769 to upwards of 3000 square feet and are located in Morgan Creek’s most desirable residential area, where you’ll find yourself just minutes from every possible convenience – South Point Mall, Morgan Crossing, access to Highway 99. Come in today and visit the 2 stunning, furnished Nuvo Surrey showhomes and find your perfect fit next to nature. NUVO South Surrey is the perfect choice for a select few. Priced from $419,900. Visit www.nuvoliving.ca or call 778.294.1201 or visit 1545 – 32 Ave South Surrey for more details. A great article titled “For the Hybrid Life” by Susan for the New Home Buyers’ Guide of Greater Vancouver talks about the latest South Surrey real estate launch at NUVO. Sizzling interiors: the first floor main living level is luxurious and richly detailed. Meticulous attention to detail is evident everywhere from the carved, solid wood handrails on staircases and double patio doors framing an elegant, sand-coloured ceramic fireplace on the heritage style doors found even on the closets in all Nuvo townhomes and South Surrey homes. The kitchen at the NUVO presale homes is a natural extension of the living room – a comfortable, welcoming epicurean centre with storage to satisfy even a gadet aficionado like me. I resist an urge to settle down at the eating bar but do succumb to taking a closer look at the wood flooring that runs throughout the South Surrey Nuvo home, family room and formal living room – such a great combination of beauty and durability. Sure enough, the NUVO condo suite is totally private, a mini retreat in the truest sense. There’s a walk in plus a regular sized closet – in no time weve agreed that that would be ‘hers’ and which would be ‘his’. Bit it’s the master ensuite at these presale South Surrey new homes at NUVO townhomes I fall most in love with. Boasting a huge soaker tub, separate shower, an ddual sinks with an intriguing soft curved front edge, the elegance is refreshing and soothing. The South Surrey real estate development at Morgan Creek NUVO townhomes offers a total of only 43 exclusive pre-construction townhouses ranging from 1800 to 3ooo approx square feet. All presale NUVO townhomes in South Surrey property market include a dedicated workspace with a private entryway, and there’s a private amenity building with lounge and boardroom that’s ideal for larger meetings or events. Prices are very affordable. The Surrey Morgan Creek NUVO presentation centre is now open. You love the city lifestyle. Shopping, live theatre, dinners out with your sweetheart. But you also have an affinity with nature. Your favourite view is of majestic, old growth trees an dliving near a natural brook is your idea of heaven. Well, look no further! Introducing the South Surrey NUVO Morgan Creek townhomes and family homes, a forward thinking collection of duplex-style townhouses boasting all this plus a stellar South Surrey location in the prestigious Morgan Creek neighbourhood. Since my last visit, NUVO townhomes’ character and persona;lity have begun emerging. I can see how over half these presale homes are tucked up against a lush, green belt running along the property’s southern edge. I’m thinking about quiet mornings listening to the birds sing from the tree branches just outside my window or taking a walk along the natural Morgan Creek that bubbles through the NUVO South Surrey property. But as a long-term home office person, it’s being able to experience NUVO townhomes’ live/work floor plans that I’ve been most looking forward to. And Sales rep Tracy is just delighted to indulge Susan. Our first stop is the South surrey Nuvo Morgan Creek show home ground level office. I confess the space immediately makes my heart beat a little faster. Filled with sunshine from two double French doors topped with transom windows, there’s a comfortable ambiance I could get used to in no time in this new South Surrey real estate development property. And as a bonus, there’s a full bathroom that’s larger than my previous condo’s main bath. We head upstairs, chatting about other possibilities for this space – home theatre, yoga studio, wine cellar, and tasting room, artists studio, and gallery, guest suite, the options are endless at the new pre-construction Morgan Creek Nuvo Townhomes in South Surrey. If you haven’t been in to visit us, don’t wait! $5000 Off Your Pre-Construction NUVO Surrey Townhome Purchase! Nuvo Townhouses is pleased to offer a limited time bonus of $5000 to spend on decorating your new pre-sale Surrey home, or you can simply reduce the purchase price by $5000. Surrey's Nuvo real estate development is an intimate community of only 43 of duplex style town homes backing onto 3.5 acres of heavily treed forest, with a tributary of Morgan Creek running through. Imagine sitting on your patio sipping coffee, listening to the birds and rustle of leaves, in complete privacy. Our homes also offer dedicated work place with separate entrance for those who prefer to work from your NUVO Morgan Creek South Surrey presale home, or use the space for a family room, guest suite or whatever your heart desires. Our 2 furnished NUVO show homes are open daily from noon until 5:00 pm and are located at 15454-32nd Avenue, South Surrey. If you require any further information please feel free to contact us at 778-294 -1201 or email info@nuvoliving.ca. The Nuvo Sales Team, Susan and Andrea. Nuvo South Surrey real estate development is getting ready to launch their second and final phase of three bedroom live/work South Surrey townhomes. Found in South Surrey real estate’s popular Rosemary Heights neighbourhood, NUVO townhomes is set amid a lush, park like setting with half of the homes backing directly onto a protected grenspace. Each of these pre-sale NUVO live-work townhomes for sale is designed with a spacious, dedicated workspace boasting separate entrance for a perfect balance between personal and professional space. So whether you’re a seamstress, an architect, or you simply appreciated an extra room in its own space, NUVO live-work South Surrey townhomes lets you take charge of your life. NUVO townhomes’ presentation centre and current display homes are open noon to 5pm daily Saturday through Wednesday (closed Thursday and Friday) at 15454 – 32nd Avenue in South Surrey real estate market. For more information about these new live/work NUVO townhomes, plcase contact 778.294.1202. Conveniently located at 32nd Avenue and 156A Street in South Surrey, Gateway at Morgan Creek townhomes’ 25 unique pre-construction Surrey homes are styled with a touch of Old World, a splash of grand heritage, and a twist of French contemporary. These luxurious pre-sales South Surrey Morgan Creek homes at Gateway townhomes include three level and three level plus bonus loft townhomes that are offered at two, three or four bedroom floor plans with side by side double garages, 13 foot ceilings, hardwood floors, granite in the kitchen and ensuite, stainless steel kitchen appliances, plus custom kitchen millwork finished to meet the upscale demands of the Morgan Creek standard. Construction is well underway with the presentation centre for the Gateway townhomes at Morgan Creek South Surrey property market presentation centre and two showhomes opening soon. To make sure that your name is on the Gateway Townhomes at Morgan Creek’s VIP priority list, call Bernie or Steve at 604.531.1111 or you can visit www.gatewayatmorgancreek.ca for more details about this South Surrey property offering. Townhomes of distinction coming soon. With only a small collection of 25 new townhouses coming to Morgan Creek’s Gateway townhome development, South Surrey newest project will be located at 32nd Ave and 156A St.
Grand opening for the Morgan Creek South Surrey community of Gateway Townhomes is in mid July 2008! With only 25 townhomes of distinction available, the 2 showhomes at Morgan Creek’s Gateway development will be coming soon. Grand heritage set in old world charm with South Surrey townhomes at Morgan creek between 1555 to 2070 square feet in size with 9 homes that feature bonus loft areas too. The Gateway at Morgan Creek townhomes in South Surrey real estate will have stunning thirteen foot ceilings, side by side double garages and low maintenance fees. For more information, please contact Bernie, Bot or Steve at 604.531.1111 or you can visit www.gatewayatmorgancreek.ca. 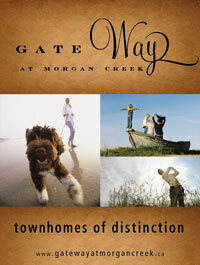 Thanks for your interest in the Gateway townhomes at Morgan Creek. We will have 25 townhomes in a great location with many features included. The price has not been determined yet by the builders, but we are guessing that they will range from 499,000 to 560,000 plus GST. Floor plans at the Gateway Townhomes at Morgan Creek in South Surrey will range from 1600 to 2122 sq. ft. We have 9 homes that will have a bonus level, that we are calling the loft. We will be having our Morgan Creek Gateway Townhomes Grand Opening for our VIP's and pre-registered guests in mid July. More Morgan Creek South Surrey real estate developments are located here. Dear Gateway VIP Registrants; There is good news for you as a VIP registrant of Gateway Townhouses at Morgan Creek! The pre-construction new South Surrey townhomes at Gateway Morgan Creek “Priority VIP Only Preview” will be held on Saturday/Sunday, August 9 & 10, 2008 between 1-5pm and we are excited to invite you to come and view 2 Spectacular Show Homes and the Presentation centre at Gateway Morgan Creek real estate development before our Grand Opening to the General Public on August 16, 2008. Please note that if you are away on holidays during these dates, please feel free to call us to make an appointment for a personal showing. These 25 new South Surrey townhomes of distinction have various impressive features: grand heritage set in old world charm, stunning 12’ plus ceilings in the living room, side by side double garage with a great storage area and even 9 pre-sales Morgan Creek Gateway South Surrey homes have a bonus level called the loft area. In addition, the new Surrey townhouses at Morgan Creek will be next to Morgan Elementary School, close to the Hwy. 99 access and the developers are allowing you to customize your new South Surrey home. See you soon! We are located on 156A & 32nd Ave. in South Surrey, the Gateway to Morgan Creek. Bernie Scholz, Bob Livesey & Steve Scholz (unlicensed) Homelife Bernie Scholz Agencies at 604-531-1111 or www.gatewayatmorgancreek.ca. This is not an offering for sale. Inspired urban living in South Surrey is now upon us at the newest planned community at Morgan Creek real estate development called Gateway Townhomes of distinction. You can even customize your own new Surrey townhome if you purchase a pre-construction pricing right now with grand heritage set in old world charm. This classy, unique and traditional South Surrey Gateway Townhomes at Morgan Creek real estate provide home purchasers with side by side double garages and very low maintenance fees. A recent article published by homebase explains this (written by S. Boyce). It’s no secret. I love surprises. So whtne Bernie Scholz invites me to check out Gateway at Morgan Creek ahead of the grand opening on July 19th, it’s an automatic “oh yes, thank you”. I’ve been intrigued by this boutique new townhome South Surrey development – especially the turreted corner home – the several months, and I can’t wait to see inside. Gateway at Morgan Creek offers a total of twenty five two, three and even four bedroom pre-construction South Surrey townhomes ranging from 1615 to 2122 square feet. The Gateway Townhouse presentation centre and display home open early August at 32nd Ave and 156A St. in South Surrey. For more information, you should contact Steve directly at 604.531.1111 or visit www.gatewayatmorgancreek.ca. the front door is an elegant eight feet high and just the first of many Ow Wow Factors I’m about to discover here at Morgan Creek Gateway townhomes. The formal living room’s ceiling soars more than 12 feet above us. Against the far wall, a fireplace with brick and wod surround becomes a focal point for social gatherings, although I confess I find myself to the huge window=box seat overlooking the frong garden. An amazing South Surrey real estate development is now awaiting home buyers in this magnificently planned and designed Morgan Creek community. The newest addition to this area are the customizable South surrey Gateway townhomes where you will find a close proximity to the Morgan Creek Golf Course, area amenities and recreational facilities. The master bedrooms have Juliet balconies or decks as well as large gourmet kitchens and spa-inspired bathrooms. Ranging from two and four bedrooms, these luxurious new Gateway Townhomes in Morgan Creek will sell out very quickly as they are well located and very affordable as a first time investment, retirement community or a family friendly South Surrey home. Reminder VIP invite to the Gateway Townhouses at Morgan Creek this weekend! See you soon! We are located on 156A & 32nd Ave. in South Surrey, the Gateway to Morgan Creek. Bernie Scholz, Bob Livesey & Steve Scholz (unlicensed) Homelife Bernie Scholz Agencies | 604-531-1111 | www.gatewayatmorgancreek.ca | This is not an offering for sale. Welcome to your new home at the Gateway at Morgan Creek beautiful new homes with two showhomes launching starting August 16th this year. With only 25 pre-construction South Surrey townhomes available at this Morgan Creek property release, the Gateway townhouses will be in short supply and huge demand as they are very well priced and provide features beyond home buyer expectations for this area. The grand opening has launched, so make sure you visit the Gateway at Morgan Creek presentation centre today to get more information about this beautiful South Surrey real estate development property that everyone is talking about. According to the New Homebuyer Guide, an article published by S. Boyce, who is the most experienced writer about new property developments in the Lower Mainland: It’s no secret, so when Bernie Scholz invites her to check out Gateway townhomes at Morgan Creek master planned community ahead of the grand opening, she is intrigued by this boutique townhome development especially with the turreted corner homes. With a small offering of only 25 new townhomes that range from two to four bedroom townhouses, the pre-sales south Surrey Gateway townhomes at Morgan Creek properties will range from a spacious 1500 all the way to slightly over 2100 square feet in interior space, which is not only a perfect size to have more functional living spaces and room sizes, but also a great area for families to grow old. The sales centre and display homes are now open for the pre-construction Gateway South Surrey townhomes and you can visit them at 32nd Ave and 156A St or just visit www.gatewayatmorgancreek.ca for all the details online including floorplans and neighbourhood information. Some of the most impressive interior features of these new Surrey townhomes at Morgan Creek Gateway town houses include the faux core ceilings, wainscoting, angular millwork, stainless steel appliances, chrome facuets, semi-formal dining rooms, loft style areas, ceilings that are over height and window box seating areas that expand any living space. In addition, the presale south Surrey Gateway townhomes at Morgan Creek masterplanned community will also be in close proximity to the Morgan Creek Golf Course, one of the newest and most highly rated courses in all of the Lower Mainland, just steps from your backyard. In addition, the other features that stand out at the South Surrey presale townhomes at Gateway Morgan Creek include the Juliette balconies, vaulted ceilings, claw-foot tubs, elegant frameless glass showers in adition to double French doors as well. Other features that impressive new Surrey home buyers at the Gateway at Morgan Creek townhomes include the inspired tiling, large windows and gorgeous views that all residents will have from their private homes. Some of the floorplans at the Morgan Creek townhouses will have loft spaces with great opportunities to convert it into a bedroom, workspace, crafts area or anything that your heart desires. With low maintenance monthly fees and a great twelve foot ceilings heights on the main floor, please visit the show homes at the pre-construction townhomes of Gateway Morgan Creek Surrey property development today. The builder is even allowing the first few home buyers to customize their home! Dear Gateway Townhomes VIP Registrants - We are excited to announce that our builders just reduced prices at Gateway Morgan Creek townhomes yesterday to reflect the current South Surrey real estate market. All 7 presale townhome units along the back have been reduced. We are now starting at $419,900 instead of $459,900. Great value for the type of finish, millwork, quality and included luxury features. These 25 pre-construction Gateway at Morgan Creek townhomes of distinction have various impressive features: grand heritage set in old world charm, stunning 12’ plus ceilings in the living room, side by side double garage with a great storage area and 9 new South Surrey homes have a bonus level called the loft area. Also, the master planned Morgan Creek Gateway Townhomes South Surrey neighbourhood is next to Morgan Elementary School, close to the Hwy. 99 access and the property developers are allowing you to customize your dream home. We are located on 156A & 32nd Ave. in South Surrey, the Gateway to Morgan Creek. Emerald Garden is a colletion of 62 contemporary pre-sales Surrey town homes conveniently located near Fraser Highway and 138th Street. These spacious, pre-construction family orinted homes are only minutes from a host of amenities, recreational opportunities, schools and parks. So whether you’re starting out or looking to move into a larger home, Surrey’s Emerald Garden is designed to satisfy. These pre-sales Surrey real estate townhouses are priced from $319,900. For more details and to priority register for the Emerald Gardens presales event, please call Thomas Tse at 604.724.8663 or you can visit www.emeraldgarden.ca. Foxridge Homes is now selling the 11th (and most likely last) phase of this single family homes in this desireable Surrey real estate community of Panorama Hills. Located at 59th Avenue and 150th Street, this limited offering of only 33 pre-sales Surrey homes is barely a minutes walk from the popular Cambridge Elementary and is close to the new YMCA, parks, golf courses, shopping, and restaurants. The Foxridge Homes at Panorama Hills Surrey features classic finishings and generous floor plans with the opportunity to customize from an extensive options catalogue, these homes are priced from $599,900. The Panorama Hills sales office is located at 14695 60th Avenue in Surrey and is open noon to 5:00 pm seven days a week. For more information, visit online at www.foxridgevancouver.com or call 604.543.9302. A U-Pick builder, Foxridge Homes declares that you will never find two homes that are identical at the new pre-construction Surrey Panorama Hills single family homes development. Foxridge of course is a division of Qualico Developments and the web site is located at www.foxridgevancouver.com where you can find out more about the new Surrey Panorama Hills homes that are located at 15038 59th Ave in Surrey real estate market. They are open between 12 and 5pm from Saturday through Thursday and you can contact the new Panorama Hills Surrey homes development at 604.543.9302 for additional details. Located in East Surrey real estate market, the pre-construction homes at Panorama Hills features only thirty three single family detached houses for sale that range from two thousand square feet to slightly more and all with unfinished basements that are roughly a thousand sq ft in size. The homes at the Surrey Panorama Hills development feature three bedrooms, perfect for growing families. The architect for the Foxridge Panorama Hills property is Canton Design Group Inc. and the interior designer is First Impression Designs. In addition, unlike many other East Surrey real estate developments, these pre-sale single family detached homes are available for occupancy right now as they have been completed. Almost four years ago, Qualico and Foxridge began development in the Panorama Hills East Surrey community and now, home owners are moving into this master planned and exciting new neighbourhood. With the eleventh phase now completing with only 33 detached family homes for sale, the new Surrey Panorama Hills houses start from just $579,900 and these large three and four bedroom homes feature 5600 sq ft lots originally where people wanted pools and large back yards, but now the last phase features more suitable and low maintenance homes. With about 250 homes in the community, the Panorama Hills Surrey development by Qualico and Foxridge Homes is nearing completion which offer all the $10k upgrades that are numerous including hardwood, carpeting, island tops, granite and much more. Also, Foxridge is offering a cash back option if the value of your East Surrey home decreases next year, ensuring that home buyers are receiving great value for their money right now while minimizing their risk. With much room for customization, the pre-sale Surrey homes here provide lots of space and aflexible unfinished basement which you can convert into pretty much anything you want. With double car garages, landscaped front and back yards s well as gas fireplaces and vaulted ceilings, the new East Surrey homes at Panorama Hills community will provide you the opportunity to purchase an upgrade package at $31,500 to finish the basement. The stunning designs with exceptional value for these Panorama Hills Surrey homes for sale starting from $548,900 plus GST. With classic finishings and generous floorplans, the homes at Surrey Panorama Hills offer exceptional attention to detail and quality. Exquisitely designed with large windows, broad decks and spacious floor plans, the pre-sale Surrey homes at Panorama Hills by Foxridge Homes offer a place where you and your family can grow. The presentation centre for the Panorama Hills houses are located at 15038 – 59 Ave in Surrey open daily noon to 5pm but closed Fridays. If you would like more information about these pre-sale Surrey houses at Panorama Hills homes, please call 604.543.9302 or email panorama@qualicogroup.com. Consisting of 21 single family homes in pre-construction with basements and a detached double garage, these Surrey houses feature great room layouts, quality finishing and maintenance free living. The Crescent Park heights South Surrey real estate community is nestled on a sloped property at 128th Street and 26th Avenue in the Ocean Park and is walking distance to Crescent Beach, local schools, transit, the Ocean Park Shopping Centre as well as a great selection of dining arenas. 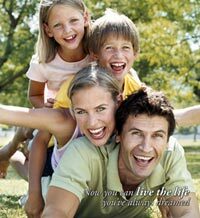 For more details about the South Surrey real estate properties of single family homes please call 604.805.6000 or visit www.padwood.com.